Much is being made in the publicity for the theatrical re-release of THE VISITOR about how the world of 1979 just wasn't ready for such an out-to-lunch epic. The truth is, it feels perfectly at home alongside other Eurotrash imports of the late 70's/early 80's with Italian filmmakers wrangling international casts of fading stars. Like Lucio Fulci's THE BEYOND or Enzo G. Castellari's 1990: THE BRONX WARRIORS, Giulio Paradisi (aka “Michael Paradise”)'s THE VISITOR takes ideas from recent hit films and adds the sort of stylish visuals and batshit incoherency that lets you know within the first five minutes that is the hallmark of Italian exploitation films of this vintage. The primary inspiration for THE VISITOR would seem to have been THE OMEN II, which the filmmakers then liberally seasoned with various science fiction elements and a heavy religious subtext. The plot concerns 8 year old Katy Collins (Paige Connor), who carries within her the DNA of Sateen, some sort of evil extraterrestrial who was killed by birds, except he managed to keep part of himself alive by turning into a bird, as well. Her mom Barbara (Joanne Neil) is oblivious to all this, as well as to the fact that her boyfriend Ray (Lance Henricksen) is somehow involved with a cabal of sinister old white guys who want Barbara to give birth to a son who will eventually breed with his sister to bring Sateen back to full power or something. It's not entirely clear, but suffice it to say they're definitely up to no good. Meanwhile a Jesus looking space alien (Franco Nero) is off on another planet teaching bald space babies along with a mysterious old man named Jerzy Colsowicz (noted director and character actor John Huston). Jerzy knows what's going on down on earth, and is determined to save Katy from her destiny. It may be too late, though, as Katy seems to be actively aware of her role and, using some of the powers that come with her birthright, willing to do anything to protect herself from those who are getting too close to the truth, like police detective Dunham (Glenn Ford). Also in the cast are director Sam Peckinpah as a doctor, and Shelly Winters as a nanny who secretly works for Jerzy. This isn't a “so bad it's good” kind of film. 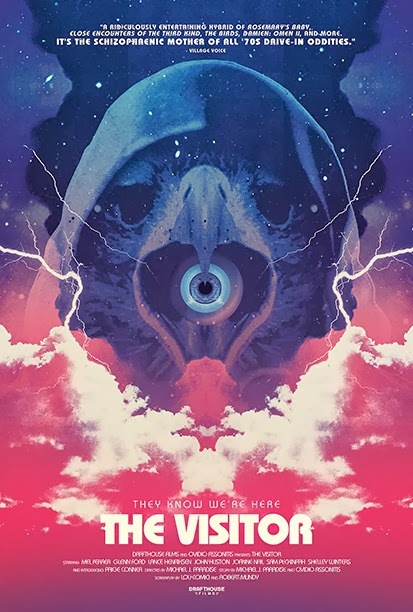 In fact, it's reasonably well made and acted, and it's clear that Paradisi and screenwriters Luciano Comici and Robert Mundi, working from a story concieved by Paradisi and producer Ovidio G. Ossontis, are aiming for something meaningful beneath the schlock sci-fi/horror trappings and borrowed ideas. And that's part of the problem, because while the movie isn't bad per se, it's certainly not that good, either. So in between the genuinely entertaining bits of weirdness the film drags. A scene where a bird takes out one of the characters who is catching on to Katy's dark side is pretty spectacular in a low budget seventies drive-in/grindhouse movie kind of way, and the climax, in which Joanne Neil's Barbara takes an amazing amount of abuse is suitably over the top, but ultimately this is no classic of its type. Still, it's kind of enjoyable to see a film of this kind and vintage get a grade A presentation and another chance to play theaters. It may have been somewhat of a second tier film of its type when it was originally released, but today it actually seems refreshingly personal and loopy despite its slow parts. 2 1/2 out of 4 stars.